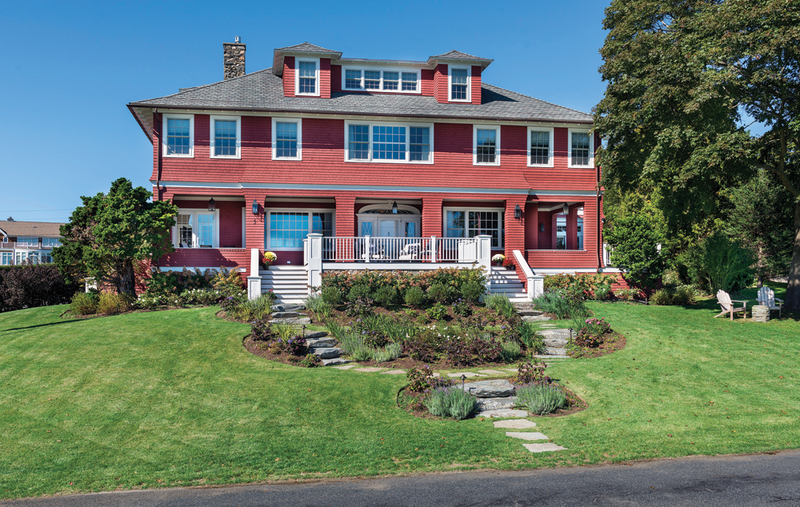 More than a century old, a Jamestown Shingle Style home with a hip roof is updated for a modern family while never forgetting its roots. Built in 1895, the Potter Cottage has a long pedigree of housing prominent bankers and merchants and it recently began showing its age. 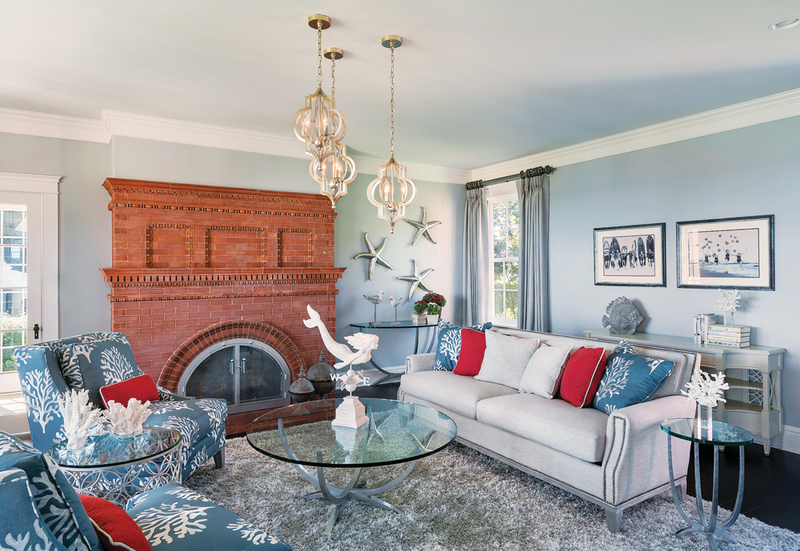 The historical house fac-ing the bay was the project of a lifetime for interior designer Kim Peterson of KEP Interior Designs. When architect Karl Sauerbrey brought Peterson on board, the interior was down to the studs, presenting her with a blank slate. Her challenge: Honor the home’s history while incorporating contemporary design for a modern family’s vacation home. The client had Rhode Island roots and a child at Brown University, but lived on the west coast full time. Two key changes accommodated the crowds: a large open kitchen/dining/family space on the first floor and a large dorm-like space with five beds in the attic, created by connecting existing dormers with a row of windows. You can see echoes of it in the woodwork, custom furniture, lighting and area rugs. Peterson’s design charge was to make the home comfortable and lighthearted with nods to both the coastal location and the historic timeline of the home. She achieved this through smart material and accessory choices, incorporating old-timey accessories in a contemporary manner. Cool colors — blues, grays, navy, teal — throughout contrast with dark bamboo floors for a casual, congenial feel. Similarly, the homeowner wanted the yard to have a more casual, whimsical design. A new landscaper made it warm and inviting right from the start with two entries and natural stepping stones to replace the formal entrance. A new family brought new life to a historic cottage, restoring it to a solid footing. Jacob Mather Design and Aquidneck Landscapes created a less formal look outdoors with more contemporary shrubbery, granite entry steps and a stepping stone walk. Photography by Nat Rea. Lighting in the family/dining/kitchen area adds a beautiful cohesion to the open space with lanterns in an aged iron finish fitted with candle bulbs for a historic feel. Photography by Nat Rea. The new glassfront cabinetry lets the light flow through while highlighting a wrought iron inset, recreated by Peterson’s father, a blacksmith. Photography by Nat Rea. “Right away I felt very at ease with the house. As much as it had a formality to it, it was very comfortable and you could almost feel snuggled with the history,” Peterson says. Lighting choices also connected past and present. 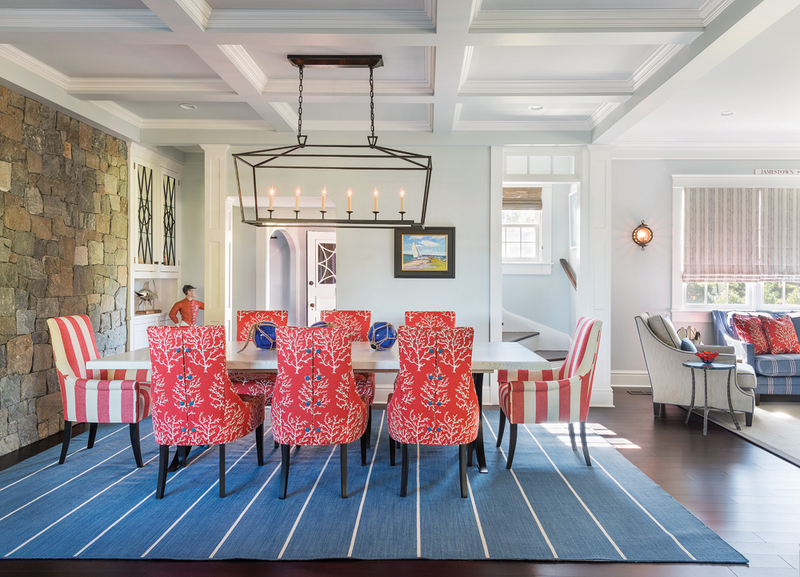 Marie Mancini of Mancini Lighting researched and sourced the unique fixtures that work for modern life while still respecting the character of the home. “We used a lot of lantern style throughout, because that was something that would have been used historically in those homes,” she explains. The front door and sweeping foyer stairway railing are original to the home, and here again, lighting highlights history; a beautiful glass flush-mount variation of a lantern is complemented by sconces that take their inspiration from 1820s London. In the living room, three hanging fixtures staggered in height draw you in to the space with a goal of enhancing the view but not overpowering it. They still have that lantern effect but are more contemporary in style. 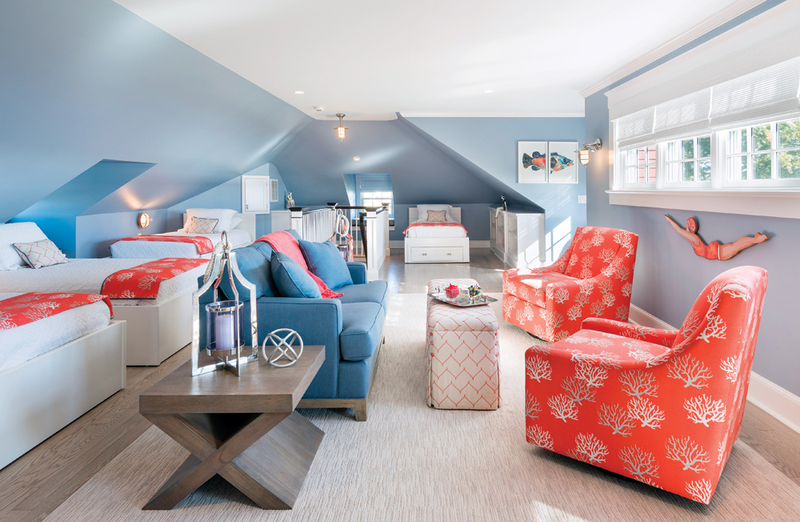 Upstairs in the expanded attic, the owner wanted a fun space for the younger crowd with a room that felt like a ship. Drawer pulls look like cleats while nautical lantern sconces frame the windows and incredible bay view. Splashes of bright coral highlight the navy palette and each bed has its own porthole style light for task work so others can sleep undisturbed. Over the two-year project, Peterson had only three face-to-face meetings with the homeowner and many design and shopping decisions were made via FaceTime sessions. Thanks to collaborative efforts and a team of experts, Peterson says the home is now ready for the next 100 years.